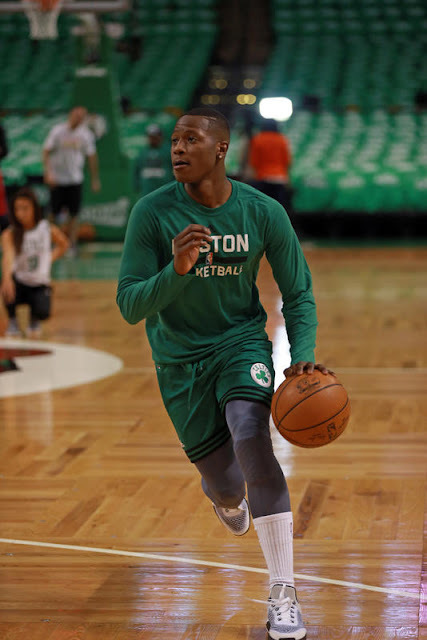 Despite nursing a sprained right ankle, Terry Rozier came off the Celtics bench to total eight points, nine rebounds, six assists, one block and one steal. The nine rebounds were critical in Boston's 111-110 win. In the final 7:19 of the game, Terry pulled down three rebounds and nailed a three-pointer with an assist credited to Al Horford. Rozier's production, despite the gimpy right ankle, was badly needed with guard Marcus Smart out with a self-inflicted hand injury. Coach seems a bit surprised that Terry Rozier, after spraining his ankle Saturday night, was able to play - and play well. “Those rebounds he got at the end were enormous,” he says. For the past three games, Terry has averaged 26.0 MPG, 10.7 PPG, 5.7 RPG, 4.3 APG and 1.3 SPG. This is a great opportunity for him to show what he can accomplish with more floor time. Last night's victory and Rozier's performance certainly helped his cause. Hopefully, he can sustain the play he has displayed over the past three games.